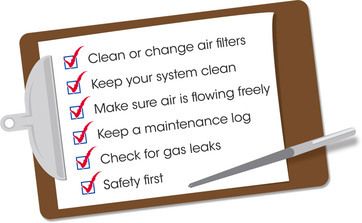 Professional annual cleanings/safety maintenance checks are just as important to keeping your heating and air conditioning equipment working properly as oil changes are to keeping your car's engine running smoothly. Coils must be cleaned, filters changed, and systems inspected for signs of wear that could lessen the lifespan of your home's comfort system. We recommend furnace cleanings every fall, air conditioner cleanings every spring, and additional filter changes during the in-between seasons, as needed. To ensure you stay comfortable throughout the year, call us today to learn more about our maintenance plans that save you money. What's Included in a Clean & Check? Show your air filters some love! 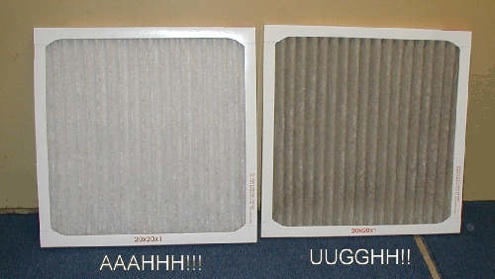 Keep your home comfort systems happy by changing your air filter every 3 months.